Professor Somasundaran received his M.S. and Ph.D. from the University of California at Berkeley and his Bachelor of Engineering from the Indian Institute of Science and Bachelor of Science from Kerala University. Before joining Columbia University, he worked for the International Minerals and Chemical Corporation and Reynolds Industries. He was appointed in 1983 as the first La von Duddleson Krumb Professor in the Columbia University School of Engineering and Applied Science, and in 1987, he became the first Director of the Langmuir Center for Colloids & Interfaces and in 1998, the founding director of the National Science Foundation Industry/University Cooperative Center for Advanced Studies in Novel Surfactant. He was also elected Chairman of the Henry Krumb School at Columbia University in 1988 and reelected in 1991, as Chair of Dept. of Chemical Engineering, Material Science & Mineral Engineering in 1992 and 1995. He has been a visiting professor/scientist at the University of Melbourne and at the Indian Institute of Science. \tHe was inducted in l985 into the National Academy of Engineering, the highest professional distinction that can be conferred to an engineer at that time, in 1998 to the Chinese National Academy of Engineering, in 1999 to the Indian National Academy of Engineering and in 2000 to the Russian Academy of Natural Sciences. He is the recipient of the Antoine M. Gaudin Award (1982), the Mill Man of Distinction Award (1983), the Publication Board Award (l980) the Robert H. Richards Award (l987), the Arthur F. Taggart Award for best paper (1987) and the Henry Krumb Lecturer of the Year (1989) and is a Distinguished Member (1983) of AIME. He is the recipient of the "Most Distinguished Achievement in Engineering" award from AINA (1980). He was honored as the only 1989 Distinguished Alumnus and the first Brahm Prakash Chair in 1990 from the Indian Institute of Science. In addition, he was awarded the "Ellis Island Medal of Honor" in 1990, along with such recipients as President George Bush, four former Presidents and Danny Thomas, the Leadership citation from the New Jersey Senate in 1991 and the Engineering Foundatio's 1992 Frank F. Aplan Award. \tHe has been honored in many countries. He was appointed as an Honorary Professor at the Central University of Technology of China, 1988-1993, and an Honorary Research Advisor at the Beijing Research Institute of Mining & Metallurgy, Beijing, China, in 1991. He was the Plenary Lecturer at the XIII IMPC in Warsaw in 1979, guest foreign lecturer at the Rehbinder Symposium in Moscow in 1981, keynote lecturer at the International Conference on Complex Sulfides in Rome in 1980, the International Symposium on Resources Engineering and Technology in Bombay in 1979, Indi's Environment: Problems and Perspectives in Trivandrum in 1986 and at several other international and national symposia. He is a member of the American Chemical Society, the International Association of Colloid and Interface Scientists, the American Institute of Chemical Engineers, the Fine Particle Society and the New York Academy of Sciences. \tHe is the author/editor of 15 books and of over 500 scientific publications and patents. He is the Honorary Editor-in-chief of the international journal "Colloids and Surfaces". He has served on many international, national and professional committees and National Research Council Panels. He served in the Congres' 28th Environmental Advisory Committee (Congressman Gilman, Chair), and has served in the National Science Foundation Engineering Advisory Committee for Chemical and Process Engineering, several NSF research panels and Engineering Research Center site review panels. 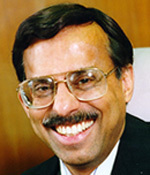 He was the Chairman of the Board of the Engineering Foundation (1993-95). He has served in several university research advisory panels, including the DOI Comminution Generic Center Advisory Panel. \tHe has served on the board of the SME/AIME (1982-85) and was a member of the executive committee of the board in l984-85. He has been a consultant to NSF, NIH, United Nations, IBM, Duracell, Exxon, Colgate-Palmolive, Union Carbide, B.F. Goodrich, LVMH, Nalco, Honeywell, Allied Signal, ALJ Corp, ISP, Pennwalt, Amoco, Unilever, etc. \tHis research interests are in surface and colloid chemistry, applications for Enhanced Oil Recovery, flotation, dispersion, waste treatment, molecular interactions at surfaces using advanced spectroscopy, polymer, surfactant and protein adsorption and biosurface phenomena.